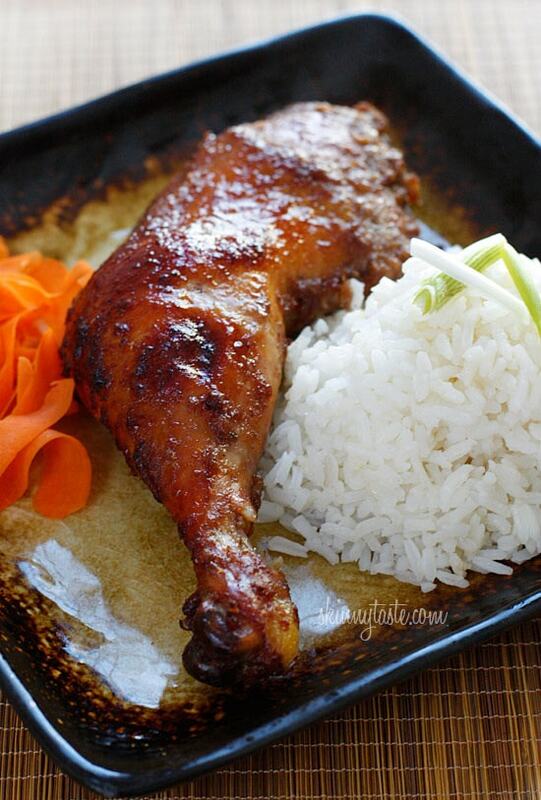 Oven roasted chicken legs take on exotic Asian flavors by the addition of a little Chinese five-spice. An easy weeknight dish, the chicken is marinated in soy sauce, ginger, shallots, garlic and Chinese five-spice then roasted in the oven. Serve this with jasmine rice or brown fried rice and a vegetable for a complete meal. I chose to use whole legs with thighs and drumsticks attached as opposed to using a whole chicken, because I find it easier to serve and I love dark meat, but you can make this with a whole chicken, thighs, legs, breasts… whatever you prefer! The sodium is hard to calculate because half of the marinade gets tossed so keep that in mind. In a blender combine the marinade ingredients; blend until smooth. 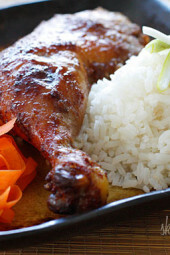 Place the chicken in a large, resealable zip-top bag or container and pour in the marinade. Toss the chicken inside the bag to cover evenly with the marinade and refrigerate for 6-8 hours or as long as overnight. Place the chicken on a rack in a foil lined roasting pan. Create a loose tent over the chicken with foil. Roast the chicken in the center of the oven 30 minutes; remove foil and continue to cook, basting occasionally until the internal temperature is 165°-170°F, about 45 minutes longer (Insert thermometer between the leg and the thigh). Hi, any idea what the smart points would be for this? Looks delicious. This looked real good. My husband thought it was good. I found it quite bland. But I also have a taste issue when it comes to chicken, I cant taste it, its like eating air, so I have to have some rather STRONG spice on it, and this just didnt do the job. I think next time, I will add some red pepper flakes and a bit of Korean sweet chili sauce in the marinade along with the 5 spice. When printing out your recipes the entire webpage prints instead of a recipe card. I just printed the five spice chicken recipe and out spat 28 COLOR pages, pictures, comments and all. Not a good look , especially when you’re trying to print out dinner for tonight while at work. As a consequence I’m having to copy and paste recipes into word documents so that only one sheet prints. That takes unnecessary time. Can you speak with your tech team to make it so that when you print just the recipe and directions come out? With all that being said, I’m looking forward to trying out several of the recipes that I’ve earmarked. Are you using the print button? Is there a way I can make this with the George Foreman? Hey Gina, I'm fairly new to the cookie game. I moved out a year ago so never really had to before! I've found your recipes super helpful and my whole family is impressed with the cookie skills I apparently had hidden. My question is, since my kitchen isn't as stocked – is there any way else to cook this besides roasting? 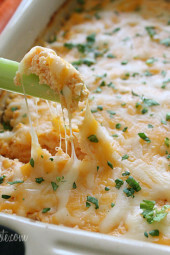 I was thinking of making it with chicken thighs… Do you think I could put it in a slow cooker and the flavor would come out ok? This was delicious. My boyfriend and I devoured it. And he's insisting we add this to the regular dinner rotation. Thanks for such a great idea! this is a family favorite!! Is the points + total include rice? 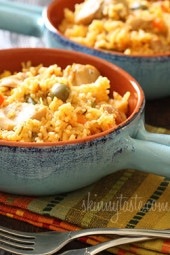 Made these tonight and they were SO flavorful!!!! I think next time I'm going to make them with skin on breasts. I'm not a huge fan of dark meat. I made this with a couple of adjustments. and it was fantastic! I added a little vinegar, a 1/4 tsp sesame oil and oyster sauce. I also used boneless chicken thighs and threw them all on the George Foreman. Loved it! I just want to add I used 2 packets of Truvia instead of agave and it turned out great. I used an old turkey basting trick of my moms on this and it was great. I poured just a bit of orange juice into the bag I had used to marinate the chicken. Shook it all up and then used that as my basting liquid. So, so delicious. I will make this many times. Thanks! Hi Gina. If I were to use boneless skinless chicken breast would I just lower the cooking time? I'm not a fan of dark meat. I made this last night…it was AMAZING! I made this last night with chicken breasts because I didn't have anything else and it turned out too strong tasting for our liking. Do you think if I used it with the suggested chicken pieces it would taste different? And I have to add that we had the leftovers tonight, served cold (I love cold chicken). It's wonderful; I'm envisioning warmer weather and a picnic basket with a container of this chicken nestled under a cold pack. Yum! This is mmmmmmarvelous! My husband does NOT have an adventurous palate (he's a meat and potatoes guy–loved your Salisbury Steak!) and I thought five-spice might be a little outside of his comfort zone, but he went back for seconds! Served it with your roasted broccoli with smashed garlic and some brown rice–a very successful dinner! Soooooooooooooooooo yummy. I emailed the recipe to my husband yesterday while i was at work and he had it ready when i got home and it was so tasty!!!! We had it with some rice pilaf and a salad. I couldnt find whole legs so he just made it with drumsticks. perfect perfect perfect. no left overs in our house!! Finally going to try this one tomorrow, can't wait !!!! Just tried this (no sugar added) with the roasted broccoli and some arugula with roasted pumpkinseeds and my boyfriend said: "I think this is the most delicious meal you've ever made" and I can only agree (I was so happy to Findus 5 spice in sweden 🙂 ) Thank you for wonderful recepies! margaret7471: how did your chicken come out w/ the licorice- 5 spice. I just marinated mine & I noticed the 5 spice I'm using has licorice root in it :(…..I hope it comes out delish. Delicious! Making this now! Smells amazing! I've planned our whole month's menu from your blog! Question– are this shaved carrots in the photo? Love the presentation, but how would you make those? Thanks! It actually says licorice! Plus star anise, fennel cinammon and pepper! Ugh. We shall see…. Margaret7471, anise has a licorice smell to it. Are you sure the 5 spice has licorice in it, or is it the anise? – Hope this helps. Mine is marinating right now but the five spice I bought actually has licorice in it and it smells VERY licoricey(didnt read the bottle first:(). I was so excited and now I am scared that it will taste like black licorice! Hmm This looks yummy! I'll try it! I made this last night and it was absolutely delicious! Even my pickiest child at 2 pieces! Thanks for such great recipes!!! Gina: I made this recipe the other night. I want to do a post on it w/photo. May I refer people to your blog for the recipe? I don't want to copy it to my blog, due to your copyright note on your blog. Can you email me let me know? Thanks! About the skin, unless I say skinless, the nutritional info is with the skin. Without would be less points. Personally, if I am going to roast a chicken I am leaving the skin on. I trimmed all the excess fat off but left the skin and yes, I ate the skin. Completely up to you if you want to eat it, but I would roast it with the skin on. I just printed this as a pdf and the pdf looked fine. Maybe save as pdf then print? The 5-spice should be in the spice aisle. McCormick makes it. This looks delicious, but when I go to print the recipe, all the ingredients are not listed, only the chicken. How can i get it to print everything? making this with boneless skinless thighs and put it on the grill. I searched all over Albertsons today and couldn't find Chinese 5 spice. Where do you find it? I definitely have to try this one. However, did you cook it with the skin on or off? If you left the skin on, did you take it off before eating? Thanks! I have this marinading right now and I've left the skin on – I feel chicken cooks better with it on and I'll pull it off mine before eating. I just tried to print the recipe, and it's blank under ingredients. Can you please check into this. These look delicious. 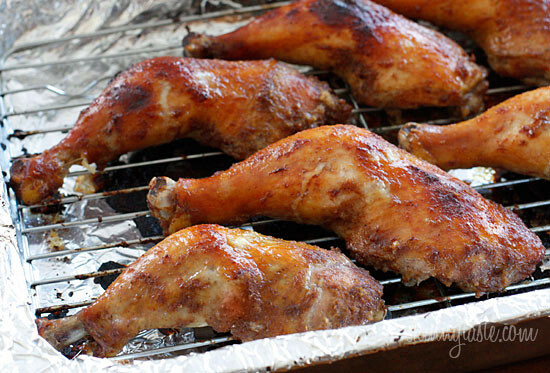 I'm not a huge fan of drumsticks, but I'm always looking for new easy healthy ways to prepare chicken thighs. 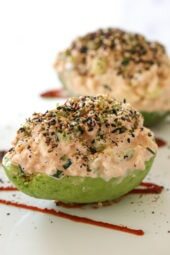 This looks great-I love using Five Spice powder. Just gives everything that "exotic" taste. Thanks for sharing! All your recipes look fantastic! I had a quick qn about the grated ginger – as someone who hates to clean her microplane, can I just throw coarsely cut up ginger into the blender (vs grating it first)? Thanks for all these amazing recipes and providing WW points for them. This looks very yummy! Just finished your swedish meatballs for breakfast. Your recipes are the best leftovers! Thank you for all the great ideas. My monthly menu is full of your recipes and we've (husband, 3 kids and I) love them all. I have tried to print this several times at the print friendly version and the only ingredient that comes up is the chicken. Is it my computer or a glitch? Help! I have a whole bottle of Chinese five spice powder I used forming recipe! I can't wait to try out this recipe with my forgotten spice. thank you Gina! this looks great! I have recently made your chocolate chip scones and baked oatmeal with banana and blueberry… both were wonderful! Any idea on how long to cook if I just use thighs? I also ask if the skin is removed in the ppv calc? Looks yummy. What is the 5 spice blend, and how do I make it at home? Looks great! Can't wait to try. Can't wait to make this! Thx for all the awesome skinny recipes! You're the best!! I have a new found appreciation for oven roasting and this looks like it would fit the bill. Looks delicious! I want to make this tomorrow!!!! How much would the points change if I just made this with chicken thighs? Thank you so much for posting gluten-free options! When I cut out gluten I had to teach myself how to cook, and your blog has really helped me along! I appreciate it so much and can't wait to try this! deeeelicious! Love more chicken recipes. I accidentally added 5 spice to chicken ropa viejo by accident one time instead of cumin. Oops… I bet it will taste better in this! Also Gina how did you do the shaved carrots? They look so great! Did you cook them peeled like that? Or did you shave/peel them before cooking? Did you take the skin off the chicken? you never fail to WOW me! i've been making your recipes almost every night and they are easy/yummy/SKINNY. my waist line thanks you! Yum! Looks great – my family have requested this for tomorrow! Looks delicious — I just bought five spice and didn't know what to use it for! Thanks for the recipe and I hope you and yours are having a lovely New Year, Gina! Are the P+ calculated with the chicken skin? OR do you remove it before baking or before eating? Is 5 spice powder something I can blend out of my own spices or do I have to purchase it already made? I just ate dinner and this is making my mouth water! Even though I'm not hungry! Looks yum! Wow! This sounds delicious! I am making this this week! Thanks! Yum this looks so delicious. Can't wait to try this! Yes, you can baste it with the marinade but be sure it's not at the very end, you don't want to mix raw chicken with cooked. that looks so delish! yum!!! Just a quick question. 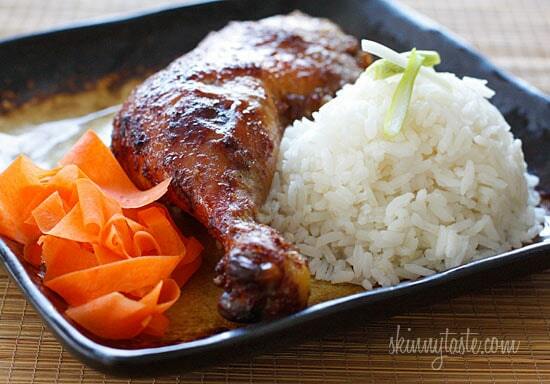 Can you baste the chicken with the marinade that the chicken was sitting in for hours? Thanks for the wonderful mean ideas. I am constintly making your dishes. YUM! Been wondering what to do with the 5 spice powder I have in my spice cabinet! These look sooo good! Don't know where I saw fish sauce. Sorry about that. Thanks. Looks delicious, can't wait to make it! This recipe calls for fish sauce in the directions but not in the ingredients so I'm wondering how much? Thanks.